‘Death Coins’ The First iOS Horror App I Co-created Is Out Now! I recently teamed up with the ghoulish D.W. Frydendall (you can see his ghastly artwork on our last four single covers) to bring you an onslaught of horror themed iOS apps. 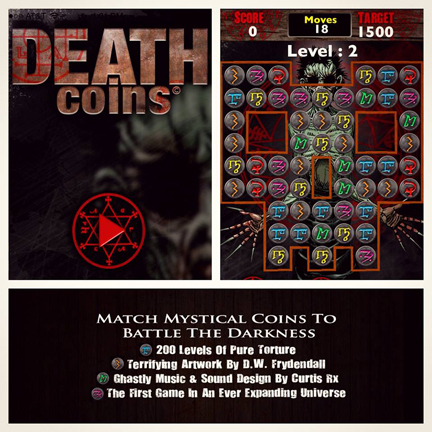 Our first game ‘Death Coins’ is available now for a free download. If this app does well and gets out to a wider audience, then we’ll have plenty more horror coming your way so please help spread the word. Click the banner below to check out and enter the world of ‘Death Coins’. 2 Responses to ‘Death Coins’ The First iOS Horror App I Co-created Is Out Now! Ey, awesome! I’ll download it now! They just don’t make guillotines like they used to.